I enjoyed Airel Tachna’s Unstable Stud, her fist entry in her Lexington Lovers Dreamspun Desires series. 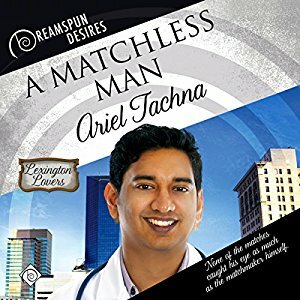 I was glad I had the chance over the past week to check out book two in the series, A Matchless Man. This time I went with the audiobook and totally fell in love with the book. A Matchless Man is a wonderful second chances/friends to lovers story. Navashen returns to Lexington after years spent in medical school and establishing his career. He hires his high school friend Brent, now a real estate agent, to help him find a place to live. Navashen needs a place not just for him, but for his special needs brother, Akshad, and eventually for his parents as well. I loved Navashen’s support of his family. He immediately gets 25-year-old Akshad out from under his domineering mother. While Akshad does need more support than most 25-year-olds, he’s able to do a lot on his own, but his mother treats him as if he can do nothing. The mother also doesn’t care for Navashen being gay. it’s an interesting dynamic as Navashen loves and respects his mother, but won’t allow her to run his life. And Navashen and Akshad are terrific siblings. I very much enjoyed their story and, in particular, Akshad’s growing independence. From the romance standpoint, it was fascinating watching Brent trying to set up Navashen with everyone except himself. It’s clear the men are attracted to each other, but are hesitant to make the move. When they do, however, it’s great–but it does have it’s roadblocks. One of the things I loved best about this book is that Tachna didn’t take any of the paths towards the romance that I thought she would. I’m not going to mention those because I don’t want to give any clues to how things unfold, but I was thrilled I couldn’t figure out how things would work out. An main character with a different cultural background was great too. There was great insight into Navashen in high school and in his currently life as a doctor that was fascinating, along with the cultural expectations on him in regard to family. Since I listened to the audiobook, I should talk about the performance. I loved John Solo’s work on the book. He handled all of the characters beautifully, giving slight accents where needed and never going over the top. I particularly loved how he handled Akshad. Solo gave a great sense of how the young man came out of his shell as he moved in with Navashen. Tachna has another installment of the Lexington Lovers series coming in May and I’m excited to see what she’ll do in that book.